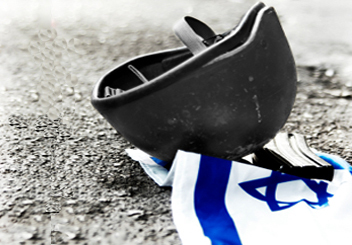 The fourth of Iyar, the day preceding Israel’s Independence Day, was declared by the Israeli Knesset (Parliament) to be a Memorial Day for those who lost their lives in the struggle that led to the establishment of the State of Israel and for all military personnel who were killed while in active duty in Israel’s armed forces. Joining these two days together conveys a simple message: Israelis owe the independence and the very existence of the Jewish state to the soldiers who sacrificed their lives for it. Yom Hazikaron, the Israeli Memorial Day, is different in its character and mood from the American Memorial Day. For 24 hours (from sunset to sunset) all places of public entertainment (theaters, cinemas, nightclubs, pubs, etc.) are closed. The most noticeable feature of the day is the sound of siren that is heard throughout the country twice, during which the entire nation observes a two-minutes “standstill” of all traffic and daily activities. The first siren marks the beginning of Memorial Day at 8:00 P.M., and the second is at 11:00 A.M., before the public recitation of prayers in the military cemeteries. All radio and television stations broadcast programs portraying the lives and heroic deeds of fallen soldiers. Most of the broadcasting time is devoted to Israeli songs that convey the mood of the day.